A large World War Two site and Type 80 radar station is visible on RAF aerial photographs from 1946 and 1950. Traces of some buildings remain. Stated by D. Edwards (NAU) to be a radar station. Shown on 1946 RAF APs as oval of five buildings or structures, not identifiable. Now consists of concrete road leading to large standing with various foundations, nearby a brick blast shelter, the bases of the iron legs of some great aerial or similar object, and a 2.5m high brick wall enclosing two concrete T-shaped footings. The RAF aerial photograph also shows various buildings to the north at the foot of the hill, but these could be merely barracks etc and not defensive. Visited by E. Rose (NAU), 25 February 1987. (S1) confirms this was a radar site; a Lancaster crashed into the mast 15 January 1945. Copy in file. E. Rose (NLA), 16 January 1995. Source  notes a mortar spigot amongst the building to south west. Recording form filed under NHER 31785 and another in this file. E. Rose (NLA), 23 February 1996. Mortar spigot located by E. Rose (NLA) on 16th March 1997. It is in a pit just to the northwest of the western of the two remaining buildings. See also NHER 32461 for defensive trenches between the site and the above- mentioned building to north. E. Rose (NLA), 18 March 1997. All of radar station cleared of vegetation by conservation volunteers and County Council in 2000. This reveals the above-mentioned mortar spigot in a silted pit. One block with iron attachments for holding stay wires reported as removed, otherwise no structural damage. E. Rose (NLA), 3 November 2000. In 1956, this site was part of project 'Winkle', testing a passive radar detection system, the other end of which was RAF Bempton (Yorkshire). (S2). D. Gurney (NLA), 20 October 2003. For photograph of aerial after aircraft collided with it, see (S3). E. Rose (NLA), 21 October 2003. A complex World War Two site and radar station is visible on RAF aerial photographs from 1946 (S3) and 1950 (S4). The site covers an area measuring 965m by 535m and there are several associated military sites surrounding it, including NHER 2788 and NHER 3555. The site consists of several clusters of buildings and defensive structures linked together by surfaced roads and tracks. These include nissen-type huts, pillboxes, spigot mortar emplacements and systems of slit trenches and pits. At least part of this site was badly damaged in 1945 when a plane crashed into the site. The main area of damage appears to be at TG 0731 4295, where many of the buildings have been destroyed and only the hard standing remains and areas of scarred ground. The only features that remain are a circular feature at TG 0729 4294, 3m diameter. This is possibly where a structure stood and it is surrounded by a triangular structure with two rectangular areas of hard standing, one to the north at TG 0729 4295, measuring 9m by 3m, and to the south at TG 0729 4394 measuring 12.5m by 4.5m. To the east of this is another area of hard standing, U-shaped and measuring 15m by 8m. To the east again are three 1.5m square structure at TG 0733 4297, TG 0734 4297 and TG 0732 4294. It is possible that these are the bases or feet for the mast that was destroyed in this location. To the north-west of these structures is an earthwork at TG 0729 4302, this consists of a key-shaped pit or cut measuring 5.5m by 3.5m. This appears to be cut into a sub-rectangular mound, 7.5m by 6.5m, and then surrounded by a square ditch. This may have been a gun emplacement or similar structure. The main area of buildings, probably not those affected badly by the 1945 crash, is at TG 0748 4314 on Bard Hill. There are ten structures of varying types and sizes. The largest structure is at TG 0745 4313 and appears to be a hut measuring 18m by 6m. At TG 0749 4315 is another building, which measures 9m by 6m. On top of the north-western end of this building there appears to be a structure, with some height, 5m by 3m. This may be some sort of mast or aerial. To the east of this is another rectangular structure, 7.5m by 3.5, built within a square walled area or blast wall. To the south of this is another large cluster of buildings centred on TG 0742 4304, including thirteen structures. The largest is a hut at TG 0741 4307, measuring 12.5m by 6m. Another at TG 0745 4305, measuring 7.5m by 4.5m. This structure is surrounded by several rectangular areas of hard standing, which suggests that some other structures may have been removed. Another large building is standing at TG 0740 4302, this consists of a 9m by 8m walled area with an entrance to the south-east. This structure may have originally been roofed. To the north at TG 0741 4308 is a circular structure measuring 3m in diameter, the function of this is not clear, although it is possible that it is a spigot mortar emplacement. At TG 0747 4306 is a cross-shaped mark, 2.5m across, this may be the base of a former structure. To the north-west of these groups of structures is another cluster of huts, centred on TG 0733 4317. 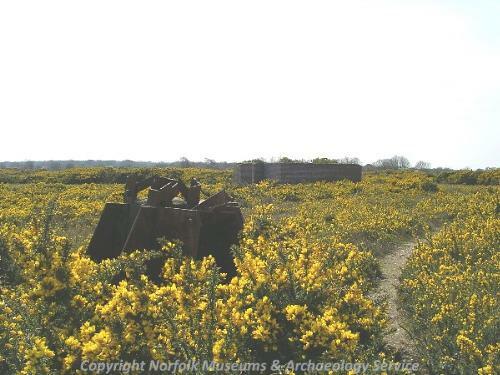 There are five nissen or similar huts standing on areas of hard standing, measuring 12m by 6m. Four of the huts are perpendicular to the road and aligned south-west to north-east, a fifth hut is aligned parallel to the road. These huts may have been barracks and accommodation. Another linear group of huts are visible in the western sector of the site on Furze Hill, centred on TG 0709 4319. There are four rectangular structures in a line from TG 0705 4321 to TG 0713 4319. These vary in size from 6m by 4m to 7m by 6m and are all linked by a network of trenches. At TG 0734 4310 is a rectangular structure, measuring 4m by 3m, which is also surrounded by trenches. Several areas of the site are also covered with trench systems, in particular at TG 0689 4313 and TG 0687 4297. At TG 0757 4312 and TG 0755 4305 are clusters of small slit trenches and weapons pits. There is also a line of four sub-circular pits running from TG 0720 4319 to TG 0720 4319. On the far west of the site on Scrib Hill, there is a square concrete structure at TG 0667 4312, measuring 4m across and with an entrance to the south - west. 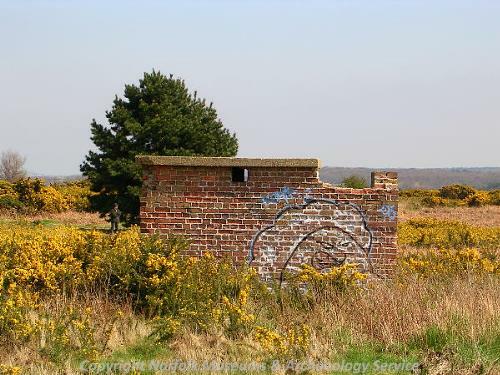 This is likely to be a pillbox, possible a type 20. The whole site appears to be surrounded with single and sometimes double lines of barbed wire obstructions and defences on the 1946 RAF aerial photographs (S3), in particular around the area centred on TG 0739 4311, the main area of military buildings on Bard Hill. On closer inspection to the 1950 RAF aerial photographs (S4), which provide a clear and reasonably close view of the site, these lines of barbed wire appears to be banks, up to 1.5-2.5m wide. In this central area in particular the defences consist of two closely set banks with a ditch in-between. This may have been augmented with barbed wire obstructions on top. It is possible that some of these banks may be existing features and boundaries that have been incorporated into the World War Two site. To the north-east of this area an outer ditch can be identified for approximately 140m running from TG 0760 4316 to TG 0758 4303. It is possible that this trench relates to the ground remains of a slit trench filled with barbed wire in this area (NHER 32461). Although it is possible that the slit trench relates to the ditches which are apparent in-between the banked barbed wire defences. S. Massey (NMP), 17 April 2003. RAF Bard Hill was commissioned as a Coast defence (CD)/Chain Home Low (CHL) radar station. On 21st January 1942 it was included in the first batch of army radar stations used for coast watching to be taken over by the RAF and it became operational immediately under its new masters. CHL was established to overcome the inability of the main Chain Home radars to see aircraft below about 1500 feet, thus fillings the gaps in the CH chain. By 1942 German jamming of the CHL rendered the stations less effective. Research resulted in the development of a pencil beam which the Germans found difficult to jam, and this allowed the RAF to 'look lower' than with the older CHL radars. The stations using this became known as Chain Home Extra Low (CHEL) stations. By mid-1943, Bard Hill was also equipped with a coast defence No 1 Mk VI radar mounted on top of a War Office 200' steel tower using the high powered equipment known as the Naval Type 277. The Type 2 CHL remained in use. On 15th January 1944, a low-flying Lancaster BIII from No. 61 squadron collided with the aerial. Nobody on the station was hurt, but one of the aircraft crew was injured and the resr of the crew were killed when the plane crashed on Langham Airfield. RAF Bard Hill was listed as operational (Type 2 CHL) in 1945 and 1947. In 1953 Bard Hill was chosen as the site of prototype Decca Type 80 long range radar known as Green Garlic. In 1960, a new Passive Defence radar was established under the codename 'Project Winkle'. A horn aerial and PDR equipment was erected at Bard Hill, with a beamed aerial at Bempton in Yorkshire. Work ceased in 1960 when the radar was dismantled. Two buildings remain. The standy generator was housed in a Nissen hut surrounded by a 7' blast wall. The blast wall survives, as do the concrete plinths that supported the generator. A small brick building nearby housed the IFF (Identification Friend or Foe) equipment, which enabled the station to identify friendly aircraft. Between the two buildings are the four metal feet of the 200ft tower, with the base of the building that housed the radar equipment alongside. See (S5) and papers in file. D. Gurney (NLA), 20 November 2008. --- Photograph: Kent, P.. 1994. KHG 3. --- Publication: Fiddian, V. (ed). 2003. Salthouse. The story of a Norfolk Village. <S1> Newspaper Article: Eastern Daily Press. 1995. Tribute to the wartime airmen. 16 January. <S2> Article in serial: Simons, R.W. & Sutherland, J.W.. 1998. Forty Years of Marconi Radar from 1946 to 1986.. GEC Review. Vol 13, No 3. p 186. <S3> Vertical Aerial Photograph: RAF. 1946. RAF 106G/UK/1571 3165-7 07-JUN-1946 (Norfolk SMR TG 0642B, TG 0742A, TG 0842A). <S4> Aerial Photograph: RAF. 1950. RAF 541/440 3036-7 28-FEB-1950 (NMR). <S5> Website: Subterranea Britannica. 2006. RAF Bard Hill..